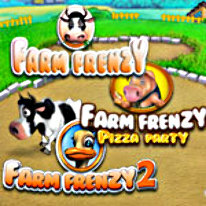 Enjoy three fun-filled Farm Frenzy titles in this great bundle: Farm Frenzy, Farm Frenzy 2, and Farm Frenzy Pizza Party. Feed farm animals, upgrade buildings, grow and collect produce in these three fast-paced time management games. In Farm Frenzy: Pizza Party, you will also have to turn your goods into pizza ingredients for delicious pizza pies. Download Farm Frenzy Pizza Bundle for hours of frenzied farm management fun.